Shelly did an amazing job! Our guest were blown away and it made our ceremony so special. We would recommend her to anyone looking to have a harp player in their ceremony! Shelley was amazing! First of all, her prices are very reasonable and were perfect for our ceremony needs. We hired her for our ceremony, only. What she was really extraordinary at was creating the perfect song for my aisle walk. My husband and I are huge Wu-Tang fans and, probably a year before, we sent her CREAM and asked if she could turn the into into a harp version. I am telling you, she is the reason that moment will be cemented in our memory forever as pure elation. I wasn't nervous or shaking once I heard her transition into CREAM and my husband and I grinned at each other as I walked down. We chose a selection of other songs for the period while guests sat and our outro and it was beautiful - her harp is loud and the perfect background music. Beyond her talent, she was very easy to communicate with and so incredibly friendly. I'd recommend her above all other musicians for ceremony music! Even under cold winds, she wowed us ! Shelley performed elegantly during our wedding precession and recession. Despite the cold winds that day, Shelley did an amazing job and really wowed our large audience. Her song list is very extensive and she is willing to learn new music. She can be easily contacted and is quite helpful in the upcoming months. We really enjoyed her being a part of our day. Shelley was one of the nicest strangers I've ever met. During our planning, we had a slight hiccup with the officiant and she was more than flexible and adjusted to all of the changes with grace. She played beautiful music and every one of my guests thought she was classy and well-composed. I wish I could do this all over again! Thank you Shelley! Shelley was so easy to work with! She sounded absolutely amazing during the ceremony and cocktail hour; we received so many compliments from our guests! She gave such a romantic feel to the rustic venue and really helped tie everything together, especially for the ceremony. Her version of "Here comes the sun" by the Beatles will make you tear as well as Canon in D! I highly recommend Shelley, you won't be disappointed! Shelley was amazing to work with and she did an amazing job with the ceremony!!!! Even more amazing was how flexible she was, last minute we were looking for someone for cocktail hour and she told us she even played piano. She was one of the best vendors we worked with. The first harpist we had cancer and it was the best thing that could have happened! Shelley was such a great find! She was absolutely amazing to work with throughout the entire process of wedding planning. She was quick to respond to any message, was professional, and flexible! Her music is beautiful!! Our guests loved listening to her play. I am so pleased we booked her and highly recommend her! Hands down the easiest vendor we worked with! While planning our wedding, we knew from the start that we wanted a harpist to play our ceremony. When we received the list of musicians from our venue, Shelley immediately stood out to us. Her music is beautiful. She was hands down the easiest vendor we worked with. She provided us with a list of songs she’s played in the past and even offered to learn a new song for us, if we had anything specific in mind. The variety of music on her list blew us away! You simply cannot go wrong with Shelley as your musician. Shelley was very helpful. Met with us a few times over the phone, even playing some songs to help us decide. Our ceremony started late but it was really nice to have her playing for our guests while we all waited. Her playing was a perfect touch to the day! Shelley was amazing from start to finish. I booked her relatively early in my planning process due to her great reviews. It ended up being a wonderful choice. Shelley performed a mix of contemporary and classic songs during our ceremony prelude, processional, and recessional, and she executed each piece flawlessly. Her timing was perfect. She helped us choose the music and was professional, responsive, and friendly from start to finish. Highly recommend! 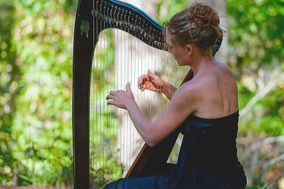 Shelley played the harp at my daughter's large, formal wedding in 2015. We were so happy with her, we asked her to play at my son's small, casual wedding this past weekend, 10/8/2017. As you can see, she can play at both small and large weddings effortlessly. We had many people compliment Shelley's work at both weddings. What a wonderful person she is. I would recommend her to anyone. Shelley was beyond amazing! First and foremost, listening to her play the harp is stunning. We loved having her for our ceremony and cocktail hour music. She was able to transform a fast song into a slow version of itself as a request from us, as well as learn an entirely new song that she had never played before. She sent us a recording of it prior to our big day to make sure we were 100% satisfied. We were 200% satisfied! We just wish we could have heard more of her playing at cocktail hour instead of taking photos! She is easy to correspond with and very reasonably priced given her amazing talent and professionalism. Shelley was an absolute dream to work with! I decided to add music to my intimate wedding ceremony at the Providence Biltmore at the LAST minute and she was wonderfully flexible and communicative and PATIENT with me as an overwhelmed bride! Every single guest commented on how beautiful and fitting the harp music was and I was so incredibly grateful that she was available for my wedding because she provided beautiful musical accompaniment to an already magical day! Thank you, Shelley!! My partner and I had an intimate wedding at The Chanler in late April and were interested in a classical harpist. We were recommended Shelley; and we were very glad we were. Shelley was beyond awesome. From the start, Shelley was easy to work with, eager to make our vision come to light, and game to add new music to her repertoire. Shelley also shared her thoughts on what we could consider for our ceremony and reception. We listened and hired her colleagues to play percussion and the cello. Shelley is incredibly talented, professional and a pleasure to work with. She comes highly recommended. Shelly was a breeze to work with. I wanted a harpist during our brunch reception to add to the ambiance of the space and Shelly is a wonderful harpist. We chose a mixture of pop and classical tunes since we knew that would be a good fit for our crowd. And she delivered! We truly enjoyed listening and for myself as the bride, having a harpist at my wedding was one of the most important details for me. I am so grateful that she could make it work (and we booked her literally a week before our wedding!!) She has wonderful energy about her and was happy to work with our needs. I don't need to recommend anyone other than Shelly! We used Shelley for our wedding at the Biltmore in Providence and she was wonderful! I think having a harpist made the ceremony extra unique and elegant :). Shelley provided great professional service and beautiful music! She also provided mics for my officiant and Spanish interpreter which was super helpful. Shelley was absolutely amazing to work with! She learned a new song for me to walk down the aisle to and it just made the day. I've gotten so many compliments on having her play the ceremony and cocktail hour. Definitely a highlight of the day for me and my guests. Shelley was fantastic and flexible. She always got back to me ideas, and when I wasn't sure what I was red her to play- she picked a beautiful selection. Exceptional artist, a pleasure to work with!